It’s been a long week, month, year (or two). When I hear people talk about our life it sounds exhausting. It would be completely understandable for me (or any parent in Rettland) to manage just to survive while caring for somebody with Rett syndrome. The thing is, I’m thriving. Here is why, we have awesome people around us. Today I got a text from a friend that received a google alert about “Claire’s Race” which is happening tonight. (If you want to see the article for yourself you can click here) I was over the moon excited for several reasons. To start, our ridiculously awesome neighbors organized this event that has already raised over $7,000 for Rettland Foundation, that the event is even happening brings me such joy. Next, news about what is happening made it to out without me being involved at all. Add to that I have friends who text me when they see alerts about Claire. Little did I know, it got even better. While I was at home,reveling in the awesomeness of the people around us, Claire was at school. On Fridays the 4th graders participate in “genius hour” They work in groups and research whatever they want and make a presentation. Today, Claire’s group was working on their presentation about Rett syndrome and when they search for information online, the article about “Claire’s Race” popped up. Let me be clear: there was a point I never thought Claire would have friends or be included. 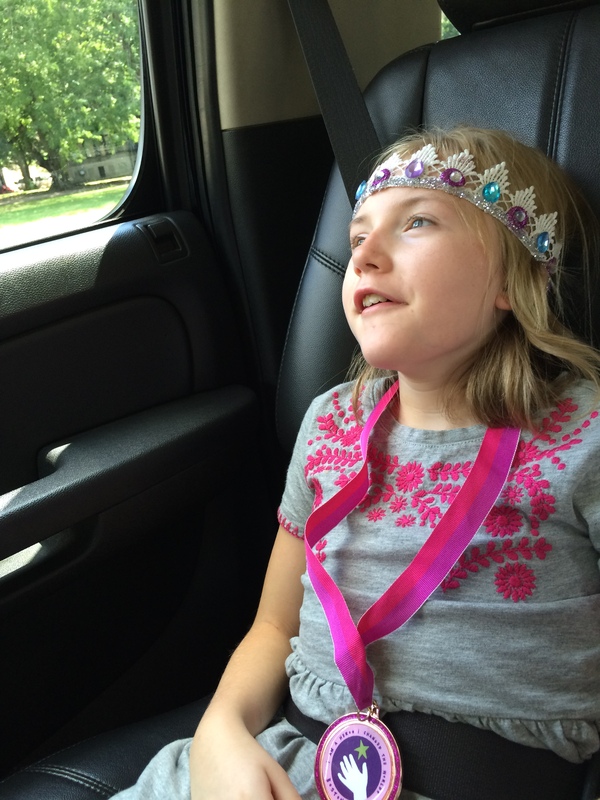 There was a time that nobody had heard of Rett Syndrome. Today, while she was in class, researching as typical 4th graders do, information about people fundraising to help popped up and it was our story. It isn’t all sunshine and rainbows and there are hard days, but keep dreaming because things like this happen, they did for us. I am just in awe as I sit back and think to myself, THIS IS WHAT RETTLAND IS ALL ABOUT and I am so glad you are here. One of the things that still takes me by surprise are the giant waves of emotion that come out of nowhere. It’s often the littlest things like two sisters playing together when suddenly a wave of grief completely envelops me. Today, I experienced something on a whole new level, unexpected joy, joy that flooded my body until I cried and shook. I knew that the package was coming but I didn’t realize how desperate I was for it until the FedEx truck pulled up to the front of the house, well the first one, which turned out to be the new ottoman. The second truck came just a few minutes later, this one with the package I had been waiting over 8 years for. My legs wobbled as I carried the light box into the house and I tried to catch my breath. This is what we had been working so hard for. 7 trips to Boston, 45 nights in hotel, 560 injections of a mystery substance and now we have a box from the pharmacy. When we signed up for the trial, we were told that there would be a provision to have the opportunity to receive the drug upon completion. Today that happened. Up until this point we have been blind, unsure of what we were giving Claire. 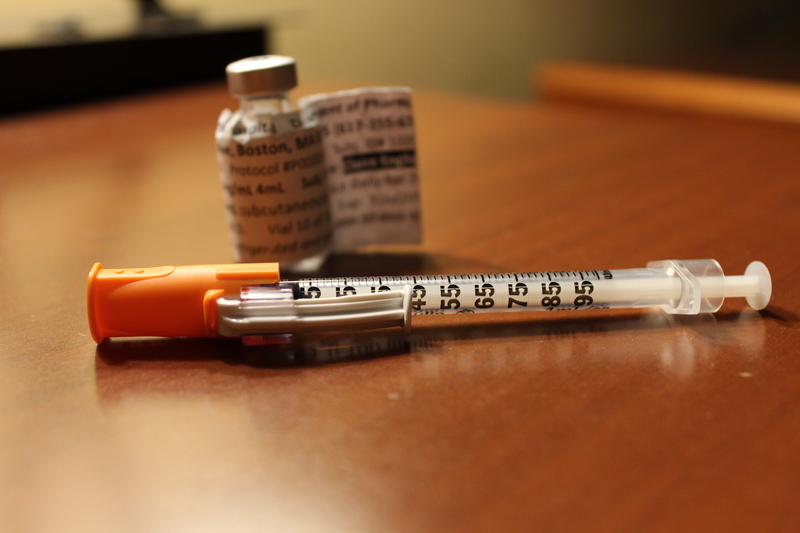 Up until today all of the shots were an exercise in research, not a potential treatment. As I unpacked the box I recalled how desperately I wanted something to give Claire in the early days, anything. The worst part about being diagnosed with Rett syndrome was that there was nothing left to do, there was no plan to get her better. I don’t know what these shots will do for Claire but it feels amazing to have something that is thought to help, amazing. This excellent progress for our family comes with one major drawback. Due to the ongoing nature of the trial, I will no longer be discussing Claire and life with Claire publicly. I don’t want people out there trying to figure out what the drug is or is not doing by gathering info from bits and pieces on the internet. It is incredibly important because the trial is blinded and we do not want to compromise that in any way. I am putting this out there because I want you to know that things are happening, just very quietly. Progress is being made on the research front for Rett syndrome and now is the time that we all need to pull together and double down and chase it until trials are done and we can all talk about how the drug is helping our children and learn different rehab approaches from each other. That day is coming, it’s just a matter of time. I have been so blessed by those of you that have joined me here. That you take the time to read my words means so much to me. I am grateful for those of you that I have been fortunate enough to connect with. I will miss this dialogue that centered around Claire but for now, we will just go on, living in Rettland as normal people do. One last thought, thank you, again, to anyone who has ever contributed to any of the world-changing Rett syndrome organizations. If it weren’t for the families who have fought for every inch for the last 30 years, I wouldn’t be organizing injection supplies tonight. Thank you. Today, in the middle of the afternoon, huddled in the coolest dark corner of our home on an insanely hot day, we officially completed the IGF-1 trial. It was just a 40 minute phone call and 12 pages of online questions, but it was the very last step in a process that changed me to my core. Just under 8 years ago we first heard the word Rett syndrome and that was a really bad day. We googled it and it was bad. 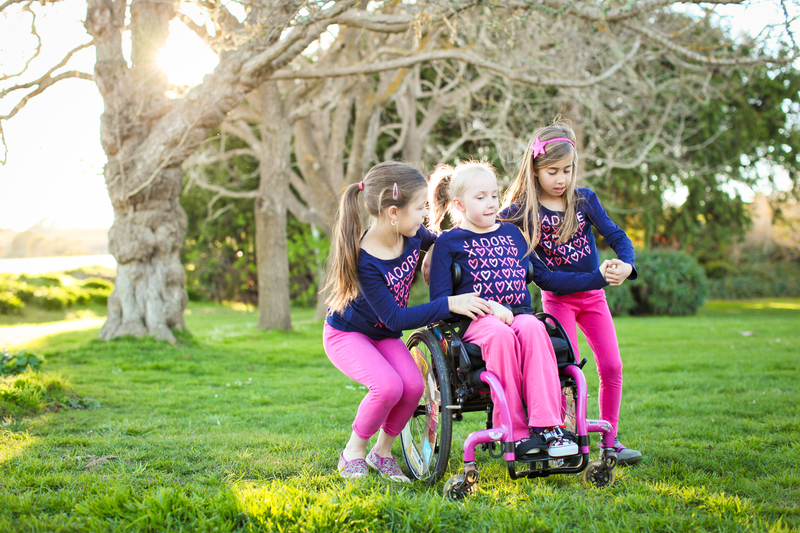 At the time, we were told that all that could be done was intense therapy to maybe slow down the downward spiral that would be our precious little Claire’s life. When we enrolled in the trial we had little idea what all we were getting in to and it is a good thing, otherwise I am not sure we would have enrolled. Now that it is completely done, I can say without a shadow of a doubt, it is one of the best things I’ve ever done in my life. Better than the marathon for my mom or that amazing time I got to hold babies in Guatemala while they waited for cleft pallet surgery. I’ve learned more about life, love, humanity and hope in the last 2 years of this trial than the 33 years before it. This process shifted who I am to my core and I am eternally grateful that we had the opportunity to participate in it. 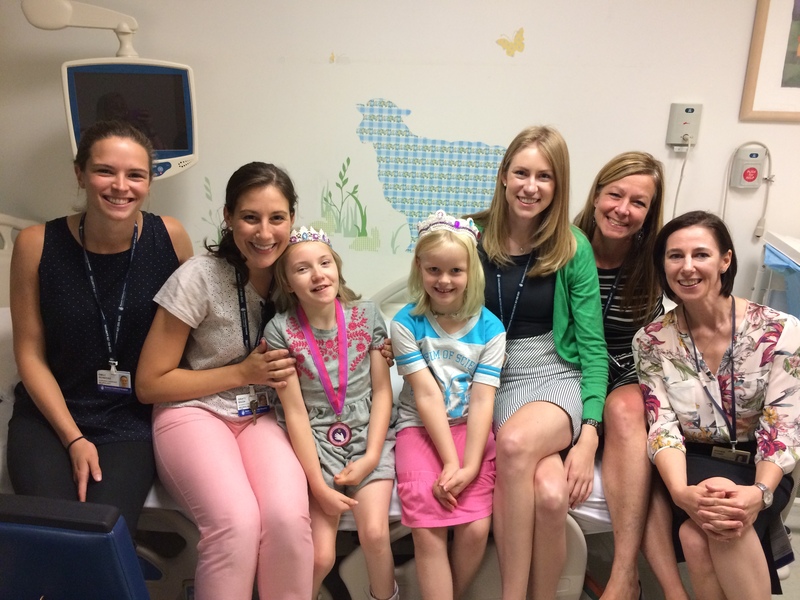 Today I know that Rett syndrome is a neurological disorder that is being aggressively studied and that teams are working with every ounce of their being, to make Rettland a place where girls are treated and they get better. It’s not far off. It’s complicated and delicate and I don’t know when doctors will be able to hand out a diagnosis and a prescription at the same time but it is a hella lot sooner than I thought it was 7 years and 11 months ago when I was struggling to breath after the news hit us. I am bursting with hope and so is Claire and that is the really exciting part for me. She knows that there will be not just downs but ups ahead as well. I am so grateful to everyone across Rettland who has made this possible. It will be hard to thank everyone but I want to thank a few. Thank you to my close friends Anne Marie, Erica and Maren, I wouldn’t have signed up for this without you. Thank you to all of the people at Boston Children’s Hospital that made this happen as well as everyone who ever held a lemonade stand or ran a mile for the Rett Syndrome Assoc. 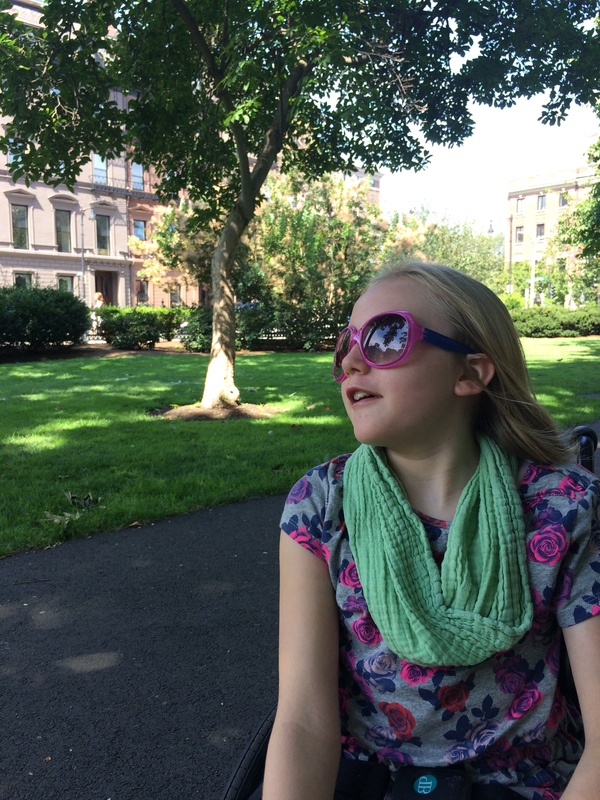 of Massachusetts and rettsyndrome.org as this trial wouldn’t have happened without that financial support. In addition, thank you to everyone who has ever donated or raised a dollar for any of the many fantastic organizations out there changing the future of Rett syndrome; Katie’s Clinic, Frankie Says Fight Rett, Cure Rett, Julie’s Army of Hope, Rett Syndrome Research Trust, Southeast Rett Snydrome Alliance, Girl Power 2 Cure, Magnolia’s Hope and the many others that are doing fantastic things in the many corners of the world. With so many different forces out there we are making progress and it is freaking amazing. I happen to be able to see it today because in this moment in time, I can look and see change. The landscape today is different than it was 8 years ago and it is different than it was 2 years ago and by different I mean better. Sincerely, from the bottom of my heart, thank you to each and every person who has ever donated or shared or supported because you’ve helped us get here and it’s amazing. Yes we are done with this clinical trial but I’m far from finished, really we are just getting started. A year ago I was sitting in a hotel room alone with Claire, crying my eyes out. Jared and Chloe had flown home so she could be at school for the first day of kindergarten. I was heartbroken to miss that day. I was heartbroken to sit and give Claire the last shot of what I suspected was a medicine that was helping her. It was an incredibly hard and painful lesson in living with what you can control. It sure is a lot easier to look back, knowing that you’ve made it. We didn’t just make it, we lived wild and alive and vulnerably. With a little distance from the crazy I can say it feels awesome. It’s a blur and surreal and I’m very tired but it’s awesome. Today we marked the end of the summer with a special breakfast and meet the teacher day at school. Both girls were thrilled with the new teachers and the friends they have in their classes. I never in a million years thought this would happen in my life. It just all felt so normal. I kept thinking; I don’t feel like puking, this is weird, I’m fine. I’m just going to go with it. I know that there will be plenty of harder days ahead, I don’t need to sit in the pain of the past. I can revel in the goodness of today and be hopeful for tomorrow. I’ve got so much that I want to say about this trip but I just can’t wrap my brain around the words yet. It has been very emotional and I hope to write about it soon. The last few days have been an adventure in every sense. We were up late washing loads of vomit laundry just hours before our ride to the airport came at 3:30 am Monday morning. Following that, Claire slept for two days, which was a scary way to start the trip. Wednesday Jared had a lot of work to get done so I planned to take Chloe to learn about research while he got to business. The only problem, I spent most of the night with a migraine and hugging the toilet, so when it came time to go, I was in bed, trying not to move. It wasn’t how things were supposed to go. Jared (aka Captain Awesome) fed the girls and got them to the appointment by 8am and brought a plate of food up to the room for when I was ready for it. He managed to work while the girls watched High School Musical in one of the autonomic recordings and Chloe was a superstar with all the changes to the plan, she rolled right with it. By the afternoon I had my feet back on solid ground and we went out to meet another family in the trial for dinner. After that we decided to walk the 2.5 miles back to the hotel and it was nothing short of pure joy. Claire giggled as she rolled over the bumpy sidewalk and her sweet smile finally graced us for a while. I listened to the gentle breeze rustling the leaves on trees. Chloe talked non stop about all the things she observed and Jared grinned. I’m finding that Boston is just life condensed. There are days when it all goes wrong and others when it goes all right. The thing that makes it bearable are the people I’ve got with me on this adventure. I’m thankful that Jared and I can be doing this together. 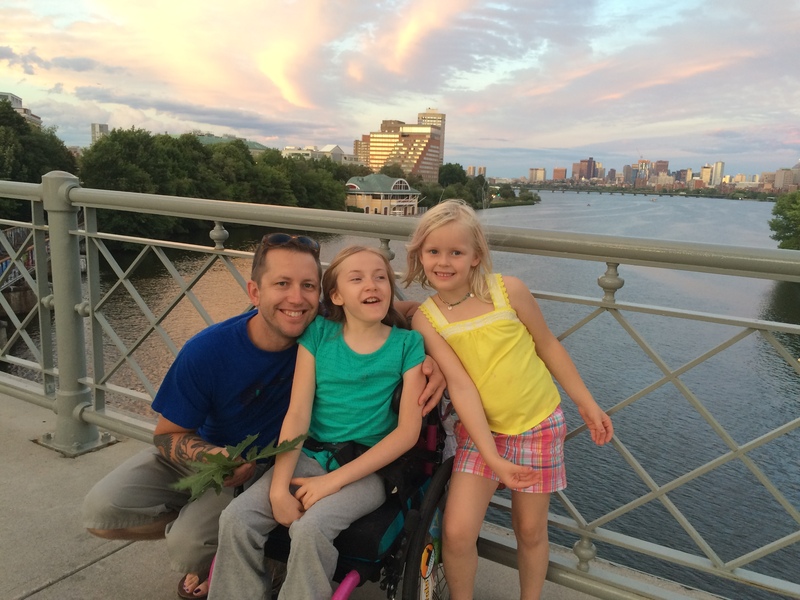 I’m grateful for the bond that Claire and Chloe share and how everyone agrees, the priority right now is doing our part to help Rett syndrome. More to come on the many other very interesting aspects of this trip. This is my lengthy way of saying, I couldn’t do it without my awesome crew. I’ve been thinking a lot about how much I don’t want to go to Boston lately. In fact, I’ve decided I don’t like trips longer than 5 days. I’ve also discovered that flights to Hawaii are shorter and cheaper and then you can sit on a beach and swim with dolphins. Instead we will fly over 2700 miles each way and go hang out with our favorite research team that we do love dearly. I have also realized (the hard way) that I can’t think about Claire living the rest of her life like this. In an effort to honor her, I try to focus on all the good, yet there is still a lot of difficult and ugly in her life. Right now, the only way I can keep putting one foot in front of the other is to only look at that next step. By back hurts from holding her as she convulses and the chemicals in my brain are all messed up from having to support her ashen, cold face after the brainstorms. 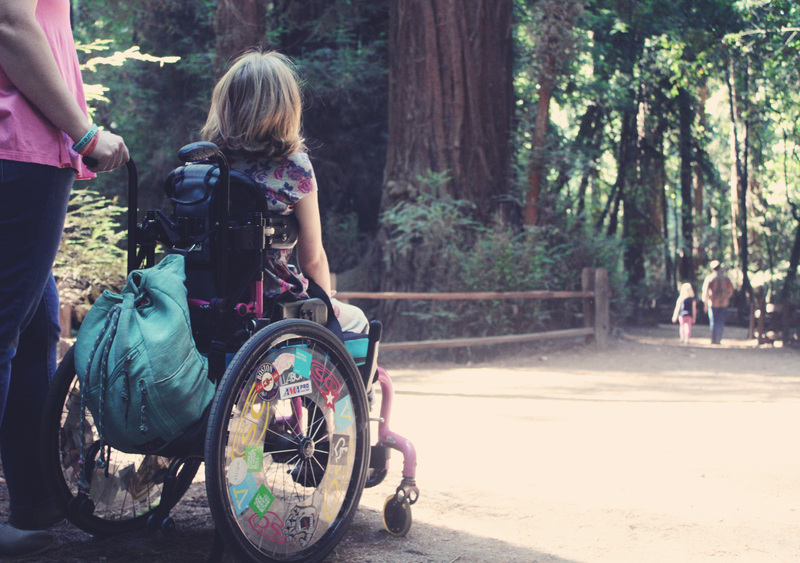 We are socially isolated by the wheelchair and the host of small things that are just too hard on Claire. We both struggle from depression as we long to speak with each other. This makes for a lot of hard, even on the good days and that’s the short list. Honestly, it feels so heavy that I don’t feel like I have it in me to go back to Boston, again. Then, as I am driving home from yet another physical therapy session, we randomly decide to listen to an old U2 album. During the first song I told the girls how I saw the band perform back when Claire was a baby in my belly. Out of nowhere it hit mean, all the hopes and dreams that were there that night and I lost my breath. The next song played, aptly named “Miracle Drug” and it took me away. It swept away my wish for a warm beach and what many refer to as “vacation”. Suddenly I was reminded why (I forget a lot). What I want more than anything is for Claire to be better and that really is within reach. It’s hard to see that far out when you are just looking at the next step, but that doesn’t mean it isn’t there. Balance is hard. I believe it always will be. Right now part of my struggle is living in a place that fully accepts and embraces Claire for who she is and how she is right now, while at the same time pursuing better for her. 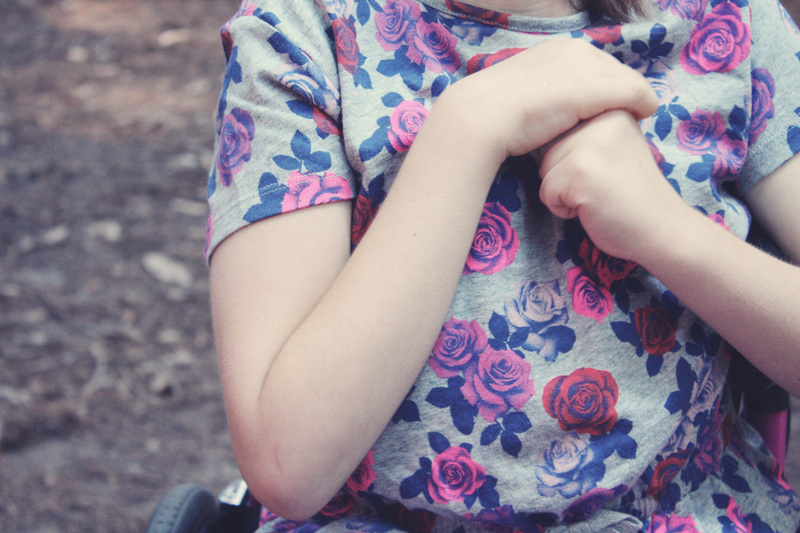 I don’t want our 9 year old to spend every day thinking that she needs to be fixed, but at the same time, I know that she longs to speak, not with her eyes but with her lips. It’s a delicate line that we walk. Last weekend we went to the WSBK races at the track not far from our home. We’ve been before. 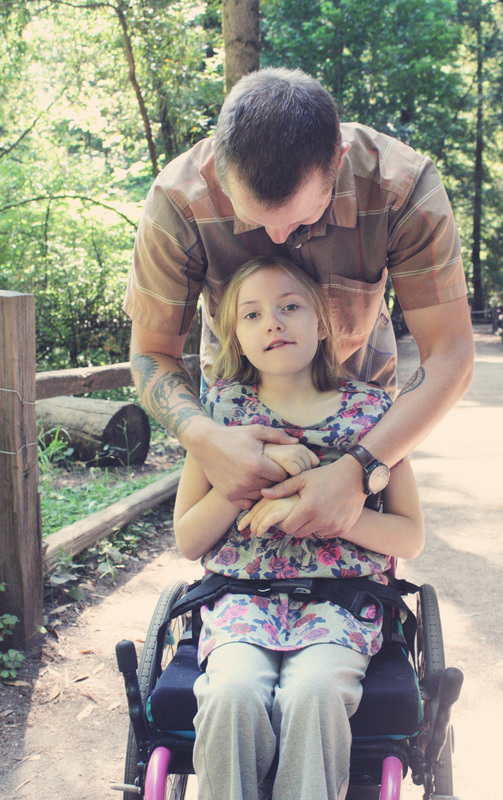 One year Claire had giant seizures just as we pulled up to park and it was a very hard day. Another year she was so relaxed and oozing with joy while we were there. This year I wasn’t sure how it would go. Either she would love it or her brain would surge and take her out. Either way, I needed to be alright and it’s just draining to live guarded like that. The good news is that she had a marvelous time. She got the thrill of watching the bikes transition between turns 2 and 3 and she loved it. If every day was like race day, I honestly don’t know that I would feel so strongly about finding a treatment for Rett syndrome. Monday came and Claire couldn’t tell her friends about the fun. She rolled her eyes as I had to feed her a cupcake and eventually her brain raged on her body. 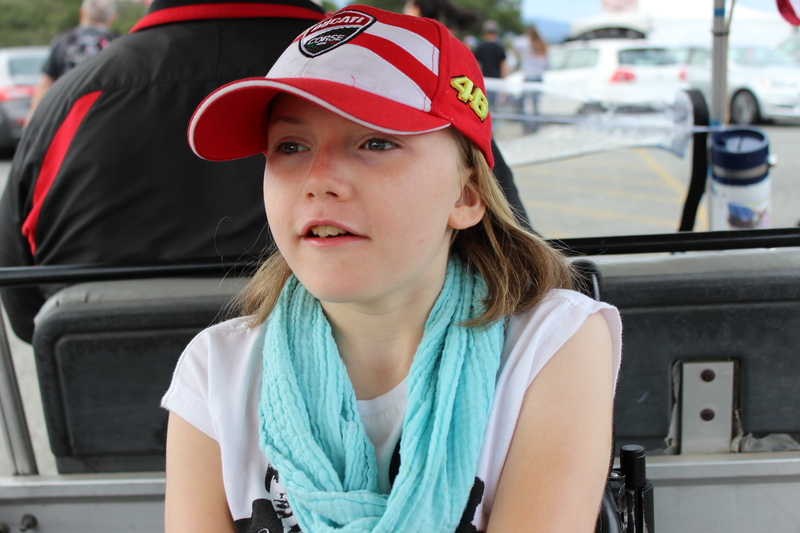 It was again clear that Rett syndrome is a problem and we want better for Claire. So with that reminder we prepare for the last leg of our epic adventures to Boston. It’s such a privilege to give Claire this opportunity, to help herself and her friends who are trapped by the same genetics. Somehow, this is our healthy, very crazy and unstable balance and for now it’s working.